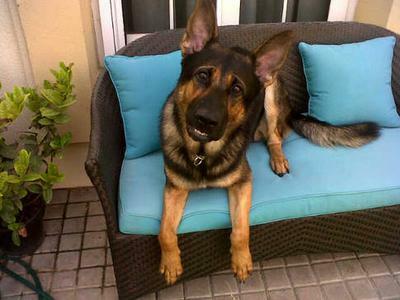 Bacci 2 years old sable German shepherd. Bacci loves to chase dragonflies, bugs and lizards! He is so playful and loves to jump off anything high to show off ! He is super sweet and will always be a puppy to me ! How are you doing? First of all, thanks so much for sharing your beautiful Bacci with us all here. He is definitely a good looking German Shepherd fella for sure!! If you ever get the chance in the future to send us some more update or pictures of your handsome German Shepherd Dog, Bacci, please do so because we would love to see them. And everybody takes videos too now, send us a video of him in action after a dragonfly or a lizard. I'm sure I'm not the only one that would enjoy that! I love his lovely sable color. I wish you nothing but the best with him in the future and many, many more years together as best buds. Thanks again, Shanna! What a Gorgeous Shepherd! German Shepherds are an Amazing breed they can do it ALL; from Police and Military to a regular family member just enjoying life. Take care of your Bacci and he will take care of you.